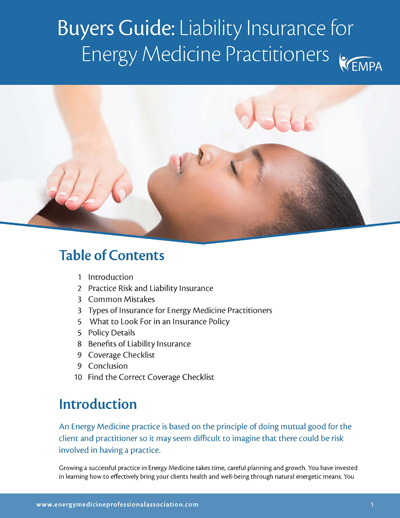 EMPA insurance is specifically designed for the Energy Medicine professional and their practice. This liability insurance is for the personal liability of the practitioner or instructor while practicing or teaching their modality with an individual or class. EMPA offers an annual policy that renews every year on April 1st and your premium is prorated based on the month you enroll. Coverage renews for a full year each April 1st. United States residents only. Coverage suited for Energy Medicine students and part-time practitioners working less than 6 hours per week. 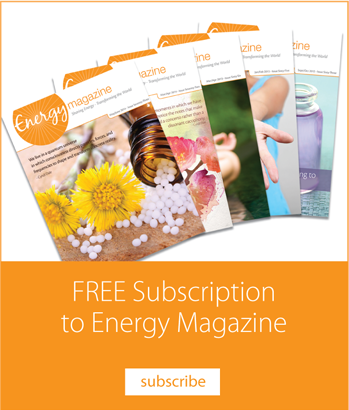 Coverage for Energy Medicine practitioners working more than 6 hours per week up to full-time practice and classes or sessions with up to 9 participants. Ideal for Energy Medicine instructors and practitioners working with groups over 9. Covers full-time practice and groups up to 99. $350 annually - under $30 a month. Applications are accepted through the online form only. Your premium is prorated based on the month you enroll. The full amount is due at time of purchase. Coverage renews for a full year each April 1st. Membership fees are included. You can upgrade to a higher level at anytime during the policy year. Protects you from suits involving libel, slander, false advertising or wrongful invasion of privacy. Covers claims made against you for damage or injury resulting from a product you use on clients. Covers fire damage to the space you work in. Umbrella Liability is included in the coverage limits listed above. Must be a US resident. Coverage is offered in all 50 United States. No deductibles for general liability or professional liability. Coverage for any place you work; an office, on site, seminar, convention, healthcare facility, spa and anywhere you travel in the United States. Coverage starts as soon as the application is approved. All covered activities must be therapeutic in nature. Activities performed solely as entertainment, such as psychic readings and fortune telling are not covered. Coverage assumes the practitioner is operating within the laws of their state, including any other legal compliance. Coverage assumes the practitioner is trained to practice listed modalities and is working within their scope of practice/training. Once purchased, the coverage cannot be cancelled during the policy term. Health/ Wellness coaches that give advice that is informative or educational but not prescriptive are covered. Many practitioners in the Energy Medicine field have training in a number of modalities. You may receive coverage for several of modalities provided you have a basis of training in a professional program that ensures that you are a safe practitioner. If you have training in a modality that is not listed below, please contact us to see if we can offer you coverage. Professional services by an attorney, architect, engineer, accountant, real estate or investment manager, physician, dentist, anesthesiologist, nurse midwife, x-ray therapist, radiologist, psychiatrist, psychologist, chiropodist, chiropractor, physical therapist, acupuncturist, optometrist, dietitian, nutritionist, herbalist, homeopathic or Ayurveda practitioner. Practitioners licensed in one or more of these areas would be covered for their Energy Medicine practice, but would not be covered for the licensed activities listed above under this policy. Any practices that diagnose, prescribe or is invasive in nature. Any martial art or combat training or activity is specifically excluded. Tai Chi and other energy movement modalities are covered as long as they are limited to teaching and training of movement, breath, and energy movement. EMPA offers partnerships with other Energy Medicine organizations, making it possible to bring this valuable business opportunity to Energy Medicine practitioners across the country. View current Associate Members. If your organization is interested in forming a partnership to benefit your members, please email us. Tokio Marine Specialty Insurance Company is a wholly owned subsidiary of Philadelphia Consolidated Holding Corporation (PHLY), a member of the Tokio Marine Group. Tokio Marine Specialty is an Excess and Surplus lines commercial insurance carrier serving specialized industries in all 50 states, including Washington, D.C. and the U.S. Virgin Islands. PHLY is rated “A++” (Superior) by the A.M. Best Company and “A+” by Standard & Poor’s. The Group is ranked within the Top 20 life/non-life insurance company groups in the world based on market capitalization. What does this rating mean to you? This means that the company insuring your practice is financially secure. This level of financial security means that the Philadelphia Insurance Companies family of companies is not required to participate in the state insurance guarantee programs that some states have. Still not sure about getting Insurance? Download a Free Insurance Buyers Guide and find out.